We know that many very small Mezuzot are very poorly and hastily written but the one below is possibly one of the worst examples I've ever seen where the letters forms are totally unacceptable in so many places - wierd pehs, tsadis that look like ayins, mems that look like chets (which is an amazing achievement - staggeringly bad! 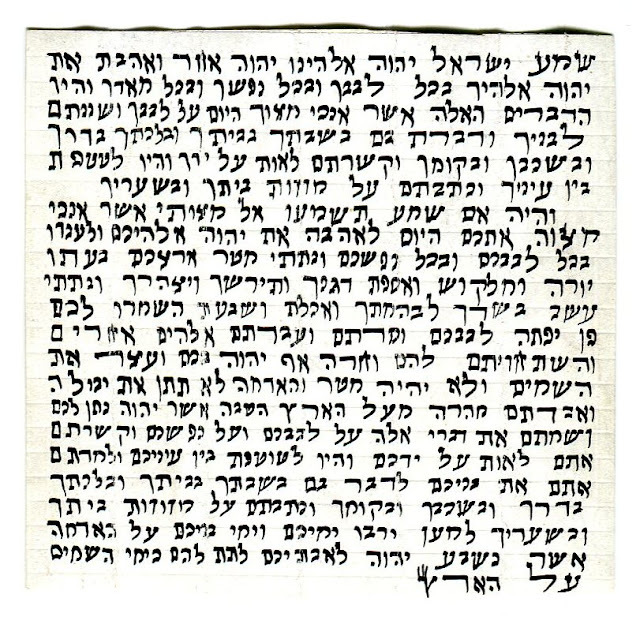 ), k'shtey milim, negiot, no enlarged letters and more. The bottom two words are also right at the bottom of the parchment which has been trimmed very badly so that they are not mukaf g'vil. I use it for demo purposes. Thought I'd share.